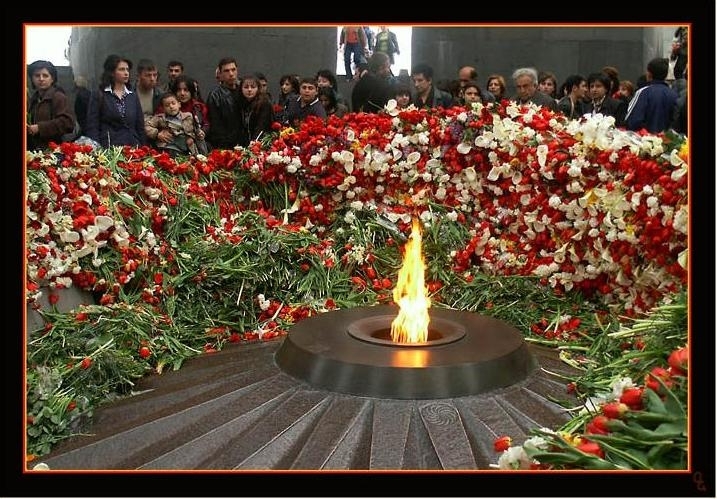 When the mass of flowers in the Armenian Genocide Memorial Tsitsernakaberd (Ծիծեռնակաբերդ in Armenian) in Yerevan gets higher than a tall man’s stature, it means that people in Armenia commemorate the 1,5 million victims of Armenian Genocide of 1915 in Ottoman Empire. One can never count the number of poems, songs, books, movies, theatrical performances, pictures devoted to the Great Tragedy of Armenian people. There are thousands of them. And Armenians always appreciate the willingness and even desire of hundreds of researchers, musicians, film directors, artists from other countries to share Armenian incessant pain. This post is about one of those great art creations. The song is called “Adana” (music by Ara Gevorgyan; lyrics by Daniel Decker). It was first presented on April 23, 2005. The video below is about a performance of this song by Daniel Decker (USA), Vitalie Dani (Moldova), Tsvetan Tsvetkov (Bulgaria), Kai Auhagen (Germany), Inka Kupomaki (Finland), Gegham Grigoryan and “Kilikia” choir (Armenia) in Tsitsernakaberd, which was broadcast on various world channels like CNN, BBC, ORT etc. Later “Adana” was translated into 17 languages. Any more comments are simly unnecessary: the video and lyrics below are the best reflection of Armenian deep and eternal pain. In the city of Adana during the darkest days of the Ottoman Empire, there began a tragedy that marked the start of what was to become known as the Armenian Genocide. The people of Armenia were forced into starvation, torture and extermination. Armenian homes were burned to the ground as women were raped and tortured, children were bought and sold and men were killed before their very eyes. Sometimes entire families were wiped out. They were accused, convicted and sentenced to die because they dared to call themselves “Christians”, their crime was in believing in Jesus Christ who died for their sins. In 1915 1.5 million Armenians were ruthlessly slaughtered, because they would not renounce their faith in Christ. Unpunished and undeterred the ones responsible for the massacre in Adana set stage for the terrible genocide of the Armenian people. Kill all who believed in Jesus’ name. Glory to the Christ, Our risen King. Though persecuted, they were not abandoned as they laid down their earthly lives, they would gain entirety with Christ. Though the world may forget, God would remember their suffering. Never again would they hunger or thirst. For the Son of God, Jesus Christ, would be their shepherd who would lead them to the springs of living water and God would wipe away every tear for their eyes. They would encircle the throne of God singing to the great I Am, worthy is the Lamp, who and is, and is to come. P.S. We will never accept the Turkish government’s denial of the fact which we keep on talking about 95 years long. Let that be their shame and inhumanity. Let that be their headache how to handle the obvious and swift process of Armenian Genocide recognition all over the world. Thank you for the lyrics. No comments…. a great song. About educated and open minded turks: I greatly appreciate their attitude. They are a part of society who can change mistakes of the past. I would like to mention that although I respect those people, I am still unable to trust them. Do not know why, but cannot. thank you for the comment Vardges jan.
as for the trust: you do not have to actually. moreover, i am not sure that i can trust myself sometimes (well, maybe that’s an exaggeration, but still), i am sure you got my point. This is not about trust, this is about a positive (though very slow, but nevertheless) change in the process. I am eagerly looking for an online translation of the song ‘Tamam Ashkhar’, by famous troubadour Sayat Nova. It’s impossible to translate without a strong background in Armenian i think. Does anyone understands it? I asked a scholar who told me it might be part of a billingual edition of his works (Armenian/French). As for the Armenian genocide, I am sure there is a message beneath it that God (or Whatever) wants us to find. Living such an absurdity (starting from the very word of ‘genocide’) for 95 years may well last another century, or could fall tomorrow if we were to find what is that (yet) hidden message. I think I have an idea of what it could be. But it’s a crazy one. Wanna know? @Jany: as for the Tamam Ashkhar, i didn’t meet an Eng version, but i’ve got your email, so in case of any news, will let u know. a crazy idea of some hidden message sounds interesting. and though the second part of the comment is not clear to me yet, i would like you to hear your supposition. You’ve done it again! Great post. Ник джан, большое спасибо от моего имени! Excellent page, well written I must say. Can you help with this? Thank you! !